This recipe is a staple at my house… It’s just SO. EASY. I’ve cooked dinner for groups before, torturing myself over perfectly searing tuna or sweating and cursing, and praying that a souffle won’t fall, then throw this together 10 minutes before people walk in the door and this broccoli is all they talk about. Melt butter in small skillet over medium heat. Add crackers and stir until dry. 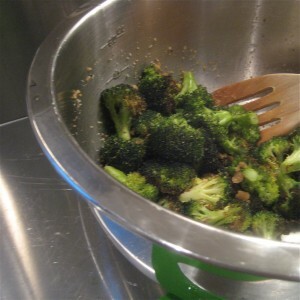 In a large bowl toss broccoli, olive oil and salt together. 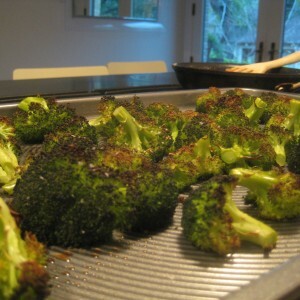 Spread into one layer on an ungreased cookie sheet and bake for 20-25 minutes, or until broccoli is tender. In a large bowl, while broccoli is still hot, toss with crumbs and parmesan cheese. Now, get ready to look all our friends square in the face and LIE about how HARD it was to make this amaze-balls broccoli. 4 Responses to "lemony broccoli"
I am so making this tomorrow. My fav veggie Kyle makes! 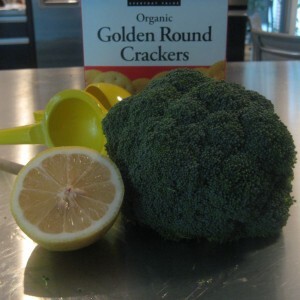 I make something very similar but toss the roasted broccoli in bread crumbs toasted in olive oil and a few cloves of crushed garlic instead. Can’t wait to try it this way. Love the blog, guys! Thanks Mandy! We’ll be trying the garlic trick.